몬세라트에 있는 본 숙소(카스테라 호텔 앤 스파)는 본격적인 부에노스아이레스 여행 시작을 위한 이상적인 장소입니다. 이 곳에서 생동감 넘치는 도시의 많은 것을 최대로 즐길 수 있습니다. Fundacion Pablo Cassara, 티트로 아베니다, Pasaje Roverano 등에 가기도 편리합니다. 본 숙소는 최고의 시설과 서비스 제공을 통해 투숙객이 편안함을 느끼도록 최선의 노력을 다하고 있습니다. 개별 투숙객의 편의를 위해 Wi-Fi (무료/전 객실), Wi-Fi (공공 장소), 레스토랑, 세탁 서비스, 컨시어지 서비스 등을 쉽게 이용할 수 있습니다. 본 숙소에는 최고 수준의 편의와 편안함이 갖춰져 있습니다. 일부 객실에서 거실, 에어컨, 난방, 책상, 미니 바 등을 제공합니다. 온수 욕조, 피트니스센터, 사우나, 스파 등을 즐기며 긴장을 풀고 편안한 분위기로 시간을 보낼 수 있습니다. 본 숙소(카스테라 호텔 앤 스파)는 부에노스아이레스행 여행객의 스마트한 선택이 될 수 있습니다. 바쁜 일상을 벗어나 매순간이 편안한 휴식이 될 것입니다. Being a frequent and easy traveler, I really seldom came across such a 4 stars hotel with incredibly bad services. - Arriving at the reception desk for check-in and handed over my passport, there is this guy who could not find my reservation details and doesn’t speak English whom just kept me waiting and standing at the reception desk for one whole hour while he serves another 4-5 groups of guests who came AFTER me. - This same guy was all the way showing his grumpiness and unprofessional attitude while trying to find me a room. Seriously is this the service that I am paying for? - I have booked the room through Agoda but this unorganized hotel does not even have my details and needed me to resent them my booking confirmation. - No single person at the reception desk speaks English or able to help. This hotel is kind of run down...I agree that some people would prefer the classic and old-stylish ambience in an old building, but this doesn’t mean a poorly-maintained hotel room! The staff was not cooperative at all and was very rude. They were exchanging money for very high price and i could feel they were racist when they saw my pakistani passport. So -10 for the manager and a young boy at the reception. Price is too expensive, given that the room interior needs renovation. Also heating was not working during my stay. location was amazing. quick check in and check out. though reception was not always giving you a smile they fullfilled your requests very quickly free internet and computer. greaqt breakfast. great shower but small rooms. wonderful restaurant with lots of international meals and local meals. noisy rooms becaue of starting to clean early rooms and also hot rooms. Location, location, location. Facilities, free breakfast. Good view. Rooms were old in the fittings. The room was older in the fittings and especially the bathroom fittings. However the service and facilities more than made up for this. They offer a first rate performance with free internet (although the two computers are always busy). The staff were very friendly and always happy to make an effort to assist. Quality of the food was good, although in BA try and get out to enjoy the food. The spa facilities are very good. I thought the jacuzzi in the spa would also be free for guests, which it is not. 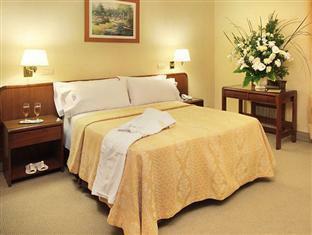 I enjoyed my stay at Castelar. I had a quiet room at the back, facing the inside rather than the street. The food was delicious. 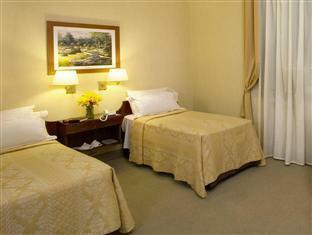 The beds big and comfortable and the TV had many TV channels. There is also free wifi and internet. The hotel has a lovely old style with a great reception and bar area. Das Castalar lebt einfach von seiner Lage und dem (heruntergekommenen) Abiente. Die Zimmer könnten sicher mal eine Umfassende Renovierung vertragen. Habe mich dort sehr wohl gefühlt! wir waren anfang mai 5 nächte im castelar. preis/leistung ist super, für ein hotel in dieser lage. die zimmer sind schön aber klein und sehr hellhörig. Man konnte manchmal den nachbarn sogar schnarchen hören. sehr schönes frühstücksbuffet mit guter auswahl. gratis wifi uns SPA (getrennt für männer und frauen, sonntag geschlossen), das war aber nicht getestet haben. negativ für uns war, dass einige vom personal an der reception ziemlich unfrendlich waren. wir reisen als backpacker und somit mit großen rucksäcken. bei der ankunft wurden wir von oben bis unten gemustert und kamen uns nicht sehr willkommen vor, obwohl wir sicher besser gestylt waren als viele andere hotelgäste. netgativ war auch, dass wir am ende unseres aufenthaltes bereits am vortag einen transfer (remise) zum flughafen gebucht haben. als der transfer kommen sollte, war auf einmal ein taxi da, mit der - wenig glaubhaften - begründung, dass der transfer verspätung hätte. das taxi war natürlich entsprechend teurer. Algunas habitaciones son muy antiguas y con una sola ventana a un respiradero, donde hay mucho ruido por los aires acondicionados. Pedimos cambiar de habitación y tuvieron la amabilidad de hacerlo. La siguiente habitación fue mucho más cómoda y sin ruidos molestos. El spa es muy bueno y bien atendido. El desayuno fue abundante y muy bueno. El día del check out nos guardaron las valijas por unas horas hasta que era el horario de nuestro vuelo. Un hotel antiguo que mantiene todos sus detalles, incluido el SPA que pienso debe haber sido uno de los primeros hoteles en tenerlo. El personal muy amable, exelente. una hermosa estadía en el centro de la ciudad con un poco de historia. 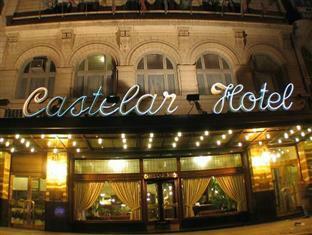 el castelar es un hotel clasico que ha sido renovado pero con poco gusto. la habitacion que me asignaron daba a un patio interior lugubre como la propia habitación. el servicio es correcto y amable. el desayuno insuficnete para un hotel de 4 estrellas que creo deberian ser 3. Servicio de Desayuno y resturant, restauración de las habitaciones, buena ubicación. Muy buena elección para el precio. Ubicación excelente, cerca de todo y con subte en la puerta. Desayuno muy completo y el Restaurant es bueno y sus precios son normales. Las habitaciones conservan el estilo antiguo y estan muy bien adaptadas a las necesidades actuales. La conexión WIFI es buena y gratis en todo el hotel. El hotel me perece excelente, justo lo que buscaba, ya que es un lugar que fué construído en la decada de 1920, y fué restaurado y cuidado para no perder nada de sus detalles originales y sí actuyalizando aparatos como sanitarios, aire acondicionado y calefacción. Por otra parte destaco la predisposición para resolver problemas, ya que uno de los días de mi estadía ocurió un problñema con el agua caliente, y el gerente en persona se ocupó del tema, disculpándose por las molestiias y compensando a los huéspedes por esta incomodidad. Localização excelente, ótimo café da manhã e atendimento dos funcionários. A estadia foi ótima, fomos muito bem atendidos no hotel e devido a boa localização nossos passeios em Buenos Aires ficaram mais fáceis e rápidos. perto do hotel existem restaurantes e café bar onde se pode comer bem, locutório e internet point vizinhos ao hotel. Adoramos a cordialidade dos funcionários e o atendimento. o horário em que é servico o café da manhã é bom e extenso. Enfim, foi uma experiencia muito boa estar hospedada no hotel.O único ponto que nao gostei foi o carpete no quarto do hotel. EWmbora o prédio seja de construção antiga o hotel está bem conservado, mas poderiam modernizar um pouco os quartos.